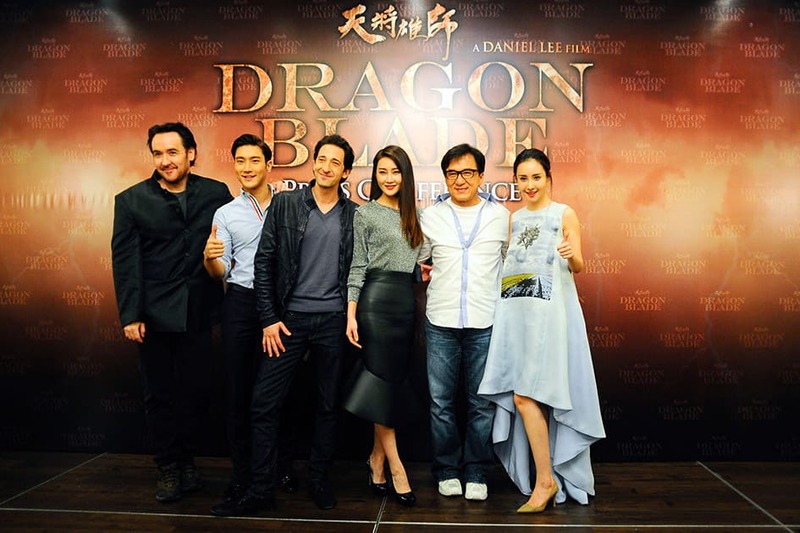 The cast of Dragon Blade, John Cusack, Choi Si-Won, Adrian Brody, Lin Peng, Jackie Chan and Mika Wang pose for a group photo during a press conference to promote their new movie 'Dragon Blade' in a hotel in Kuala Lumpur, Malaysia. Sport Illustrated swimsuit model Hannah Davis holds her an issue featuring herself on the cover at an event in New York. A model displays an Autumn/Winter design by Maria Escote at Madrid's Fashion Week. Dancers in cheerleader costumes perform as they pose for the photographers next to a wax figure of US singer Taylor Swift during a photo call in central London.